F3A104-06 AC Power Cord - MTMnet, Inc. 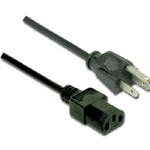 The Belkin F3A104-06 is a standard 3 prong AC Power Cord. Same as Cisco CAB-AC= and the CP-PWR-CORD-NA power cord.